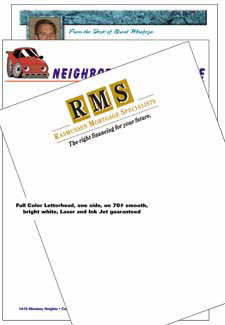 Enhance your professional image with quality letterhead. Every communication you send is a promotional opportunity. 8.5 x 11, full color one side, on 70# smooth, bright white, Laser and Ink Jet guaranteed. Design not included but available if needed. Call for details and pricing.